Why and how we’ve changed the way we manage driftwood orders. We’ve also changed the way we sell our driftwood pieces. Driftwood Orders. 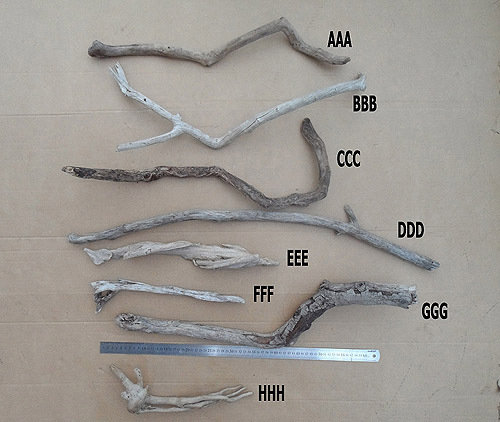 The old way we used to manage our driftwood orders was to email customers photos that showed the driftwood pieces with letters of the alphabet next to them. In the email we’d list the different prices for the different pieces. Customers could choose just some of the driftwood pieces in a photo. For some driftwood orders we would email several different lots of driftwood photos. The ruler in this photo is 60cm long. We started taking driftwood orders several years ago, and it was a dream come true. How lovely it was to collect driftwood pieces on the beaches in or near East London in South Africa, and get driftwood orders – for something we were just finding on beaches; for something that wasn’t costing us any money to first buy or make. 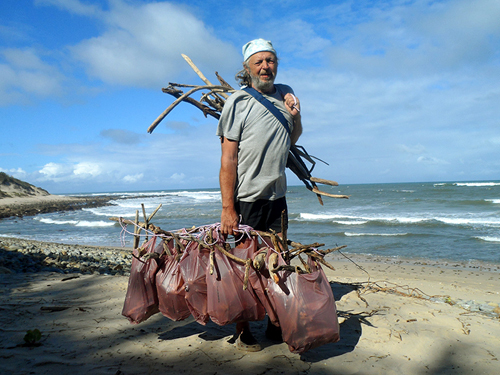 Collecting driftwood from the beach in South Africa is not always fun or easy. We loved taking driftwood orders, after a customer would contact us from our site (this site), and we enjoyed pleasing our customers. Pleasing our customers meant we got emails thanking us for our great service, and we love those kinds of emails! Those emails make us feel that our efforts are appreciated. We do have some busy months, but more often than we’d like, we also have quiet months. We work from home and if we’re not working (which includes spending lots of time on marketing) we can’t earn. Not earning means we wouldn’t be able to pay our rent or have money for even basic living expenses. Time becomes quite precious during quieter business months. In quieter months we need to spend a lot more time marketing. Working from home in South Africa. We work from home doing several different things. 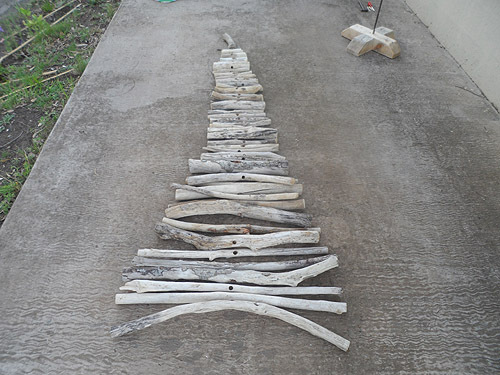 Here we have placed the pieces of a driftwood Christmas tree in size order for threading onto an iron rod in a wooden base. At the time of writing this (February 2019) even in busier months we are not yet making enough work from home income to live totally comfortably each month. We don’t have staff; we are not owners of a large business; it’s just the two of us who work from home simply making our living each month. 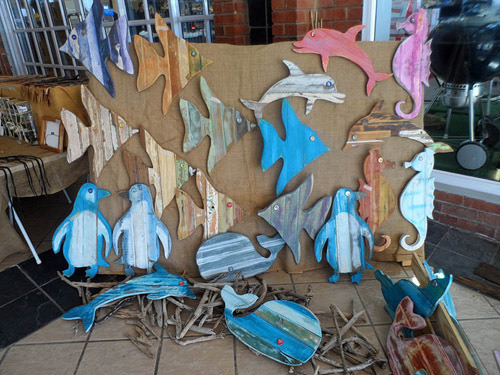 Reclaimed wood sea animal wall hangings in South Africa. We’ve been making these wooden sea animal wall art items since June 2018. They are currently (February 2019) still our main handmade craft items that we sell at local weekend craft markets in or near East London. For an idea of size, the pink and blue seahorses at the right are each 60cm tall. We make seahorses, sharks, whales, angel fish, starfish, dolphins, seals and penguins, and will be adding other animals soon. Every single item is unique. Our work from home includes selling driftwood pieces, making handmade crafts and selling these handmade crafts (like reclaimed wood sea animal wall hangings) at local craft markets in or near East London in South Africa every single weekend. We also do a little freelance online website-related work, and make a little from blogging. Slowly, bit by bit, it seemed to creep up on us over a period of a few years – a nightmare regards taking driftwood orders. So, recently at the time of writing this (February 2019), we decided to change the way we manage our driftwood orders, and change the way we sell our driftwood pieces. Manage driftwood orders – the old way. It’s a 60cm ruler in the photo. What was the nightmare? What was going wrong? We like to think of ourselves as kind, good people, keen to please everyone, keen to offer an excellent service, but we were trying too hard at a detriment to ourselves, and to our work from home income. A potential customer would contact us from our site (this site) and ask if we had a specific type or length of driftwood pieces. We’d reply, and if we had similar driftwood pieces in stock, we’d sort through our driftwood pieces removing just some of those lengths. 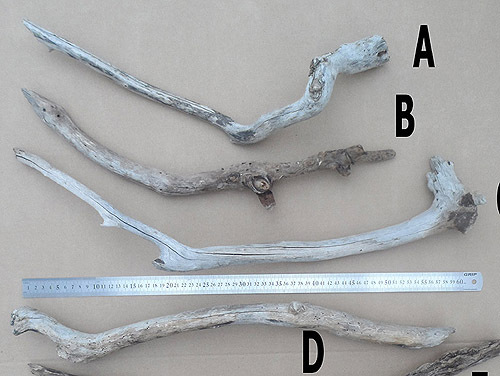 18 driftwood pieces each of between 25cm and 45cm in length. This is an example of how we used to display and photograph our driftwood for sale; of how we used to manage driftwood orders. We would edit the photos to include letters of the alphabet next to individual driftwood pieces, so that customers could select just some of the driftwood pieces in a lot. We’d take several lovely photos of the pieces nicely displayed on cardboard or hessian with a 60cm ruler in the photos too. 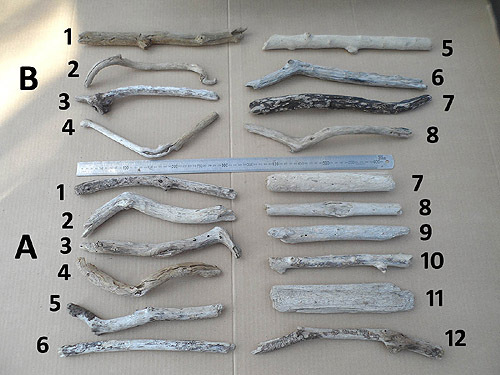 Then we’d upload the driftwood photos to our pc, edit them smaller, often add text to the photos too (like numbering the individual driftwood pieces so that customers could easily select their favourite pieces), and email the driftwood photos to the customers. We thought we were offering our customers a friendly, personal, and great service. 6 driftwood pieces. 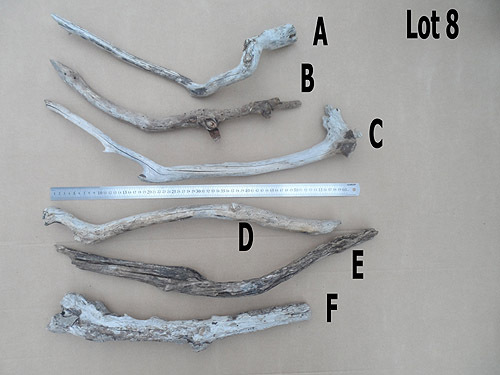 It would often be several photos of different driftwood lots that we would prepare and email to interested persons. 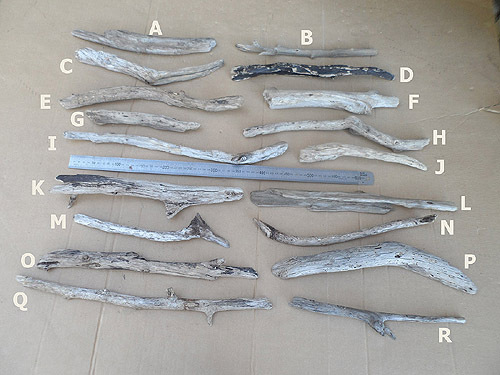 6 driftwood pieces – closer photo. 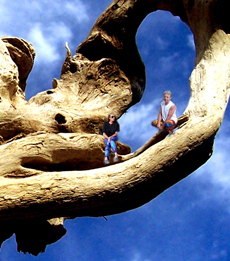 We would often email more than one photo per driftwood lot. We like to show interested persons the entire lot, and then some closer shots too. Then wait for them to select their favourite pieces, and wait for them to let us know that we could send the invoice. Then also wait to receive confirmation of payment. 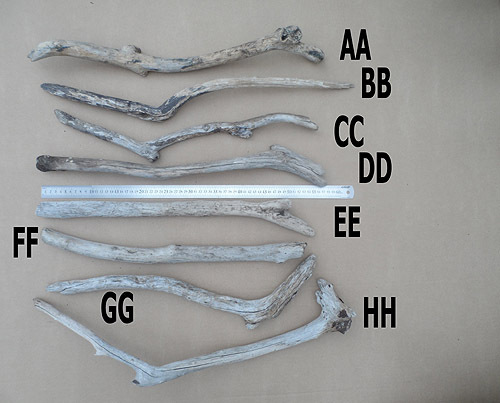 Customers can no longer select just some pieces of driftwood in a photo containing several pieces. We now upload photos of driftwood lots (groups of driftwood pieces) for sale to our site and customers are required to buy an entire lot (all driftwood pieces in a photo). Why did we change the way we sell our driftwood pieces? It takes less time to prepare driftwood photos that don’t need individual driftwood piece labeling in a photo editing program. 20 driftwood pieces with letters and numbers added to the photo. PS, it’s a 60cm ruler in the middle of the photo. We’re going to repeat an earlier paragraph here: Then wait for them to select their favourite pieces, and wait for them to let us know that we could send the invoice. Then also wait to receive confirmation of payment. This is where issues started creeping in. Our How to Order page details it, but, in summary, we now have deadlines before moving on to the next interested person. 24 hours to request the invoice, and 24 hours more to send proof of payment. Why change the way we managed our driftwood orders? Packing driftwood into a small car. It costs petrol, effort, and time collecting driftwood at the beach. Outright costs: renewals of domain and hosting of a website, cost of Internet for emailing customers, cost of Internet for time spent working on our site, cost of Internet for online marketing, petrol cost to visit beaches to collect driftwood, petrol cost to visit Postnet on Fridays to post parcels. Don’t get us wrong – we love collecting driftwood on beaches and selling it. We just literally cannot afford to waste time, or keep specific driftwood pieces aside for very long before needing to offer them to another interested person. Interested persons would “let us down” or “waste our time”. We’d email the photos. And then wait to receive an email from the interested person as to which pieces in the photos they wanted to order. Sometimes it was days before we’d receive an email back. Sometimes they asked for more time because of this reason or that reason. Sometimes we’d never hear from them again. That was just the first part of the communications, waiting to hear which specific pieces in the photos they wanted. Next up was detailing the pricing and making sure they were ready to receive the invoice. Then too, some would take several days before letting us know we could email the invoice. Sometimes we never heard back from them at all. If it didn’t end there, we were finally at the last step – sometimes weeks after an interested person first contacted us – the last step was waiting to receive confirmation of payment so we could go ahead and package and post their parcel. Sometimes we’d wait days, or not hear back from the customer at all. The nightmare was: having only so many driftwood pieces in stock, not yet having the time to go and collect more, and having other customers interested in similar driftwood pieces. We couldn’t yet help those new interested persons if we were still waiting to hear which pieces a previous interested person didn’t want. But still, even though we started to brainstorm about maybe changing the way we managed our driftwood orders, we carried on doing things the way we always did, managing our driftwood orders in a way we thought was friendly and personal, after all, it was only usually about 1 in 4 to 7 customers who “let us down” and we wanted to continue offering what we thought was an excellent, personalized service. We like to please our driftwood customers here in South Africa. We really appreciate the customers who appreciate our service – a shout out now to those who select their favourite pieces quickly, ask for the invoice quickly, and pay quickly – THANK YOU! Your driftwood orders are a pleasure to fulfill! For us who work 7 days a week, 52 weeks a year, to make our living, we can rarely afford to lose two whole days of work. 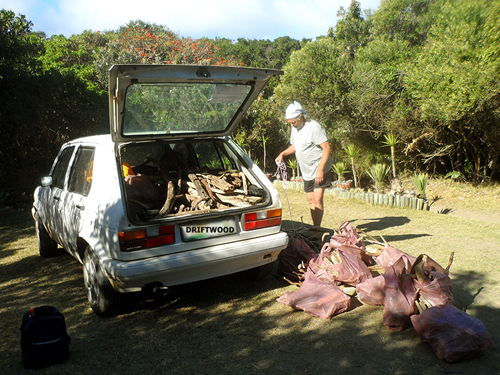 We were busy with preparing driftwood lots and photos of the driftwood lots for 3 separate customers in 3 separate towns in South Africa at the same time. It took most of two days. We were finally ready to email the 3 customers the driftwood photos. All 3 replied that they liked the driftwood pieces, that the pieces suited their needs, but that they could not yet order or were not yet ready to order. Many customers may not like that we have 24 hour deadlines now, and that they have to buy an entire lot of driftwood pieces rather than just some of the pieces in a lot, but we’d like to point out that we’ve settled somewhere in the middle now. No longer are customers given several days, sometimes weeks, to decide if they want to go ahead and select and order and pay. But at the same time the new way that we sell and manage our driftwood orders is also not like going in to a shop or as impersonal as purchasing something online from a shopping cart site (an instant transaction: select what you want, order it or take it to the till, and pay). Our new way gives you two days to decide if you want to go ahead or not, and we’re okay with giving you two days. It still allows us to be friendly and personal with managing our driftwood orders. This entry was posted in Driftwood and tagged beaches, driftwood, driftwood orders, driftwood photos, driftwood pieces, south africa, work from home on February 9, 2019 by The Driftwood People - Terry and Tony.